“The Return of Sancho, The Not-So Silly Billy Goat” from Christian Faith Publishing author Elizabeth Dettling Moreno is the sequel to “Sancho, the Silly Billy Goat.” After Sancho finds a new ranch to roam, his actions quickly speak louder than his past. In the children’s book, “The Return of Sancho, The Not-So Silly Billy Goat,” Sancho learns that his past does not define him. While he is helping those in need, he finds that his new life is better than he expected. All it took was a second chance and the faith that it is possible to have a change of heart. “The Return of Sancho, The Not-So Silly Billy Goat” is the creation of published author, Elizabeth Dettling Moreno. Elizabeth is a wife, mother, grandmother, and friend with a heart for teaching and sharing. She worked twenty-four years as a public-school teacher, including twenty years as a junior high language arts teacher in Bay City, Texas. The Moreno’s have six children, sixteen grandchildren, and one great grandchild. They are members of Abundant Life Church in Wharton, Texas. Outside of her own writing, Liz Moreno helped Holocaust survivor Helen Colin write her autobiography, “My Dream of Freedom, from the Holocaust to my Beloved America,” which was published in 2013. Mrs. Moreno’s first publication, “Sancho the Silly Billy Goat,” came off the press in February of 2016. Published by Christian Faith Publishing, Elizabeth Dettling Moreno’s new book is a great example of how simple acts of kindness changes a person and their way of thinking. View a synopsis of “The Return of Sancho, The Not-So Silly Billy Goat” on YouTube. 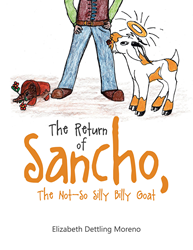 Consumers can purchase “The Return of Sancho, The Not-So Silly Billy Goat” at traditional brick & mortar bookstores, or online at Amazon.com, Apple iTunes store, or Barnes and Noble. For additional information or inquiries about “The Return of Sancho, The Not-So Silly Billy Goat”, contact the Christian Faith Publishing media department at 866-554-0919.